117 Late gadolinium enhancement of the right ventricle – is it really different from the left? It has been suggested that, in late gadolinium enhancement (LGE), the signal of right ventricular myocardium is nulled at a shorter inversion time (TI) than the left. While we have observed a similar finding that might be suggestive of an apparent difference in optimal TI between the right (RV) and left ventricle (LV) in some of our patients, our experience has convinced us that this discrepancy is merely due to an artifact. To illustrate our hypothesis, using clinical cases examples and computer simulations. We reviewed the LGE images in short axis (SA) of 6 exemplary pediatric patients (ages 9–17 years), acquired on 2 different 1.5 T systems (Signa CV/i, General Electric Healthcare, figures 1, 2, 3, 4, and Avanto, Siemens Medical Systems, figures 5 and 6), 10–20 min after administration of gadolinium and using customary LGE sequences. 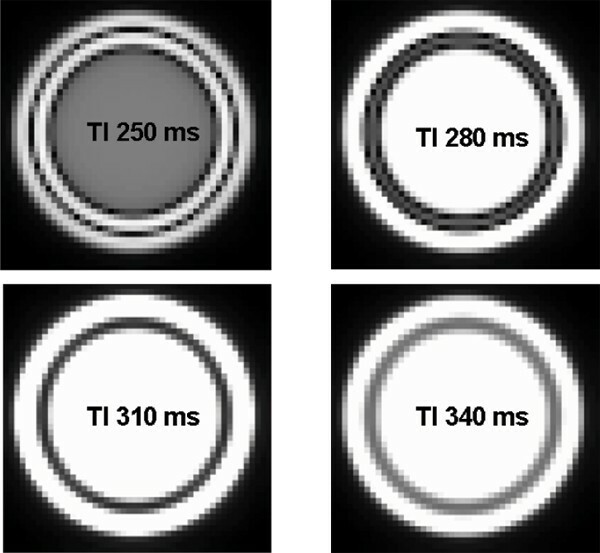 In a computer model of a ventricle in SA, assuming typical T1 times for gadolinium-containing blood, myocardium, and epicardial fat, we simulated a suboptimal TI and different in-plane and through-plane resolutions (figures 7 and 8). 1. Hypertrophied RVs exhibited the same TIs as LVs (figure 1, 17 year old boy with hypertrophic cardiomyopathy). 2. Suboptimal TIs produceed a black rim artifact at the blood-myocardium and at the myocardium-fat borders of both ventricles (figure 2, 17 year old girl with suspected arrhythmogenic right ventricular dysplasia [ARVD], figure 4, 17 year old male with repaired Tetralogy of Fallot, black rims along the endo- and epicardium as well as along the gastric mucosa, figure 7). 3. The width of the black rim increased with increasing pixel size (figures 5, 17 year old girl with sinus venosus atrial septal defect and partial anomalous pulmonary venous drainage, figure 8). 4. The black rim changed little with increasing slice thickness in SA (figure 6, 9 year old boy with mixed aortic valve disease). 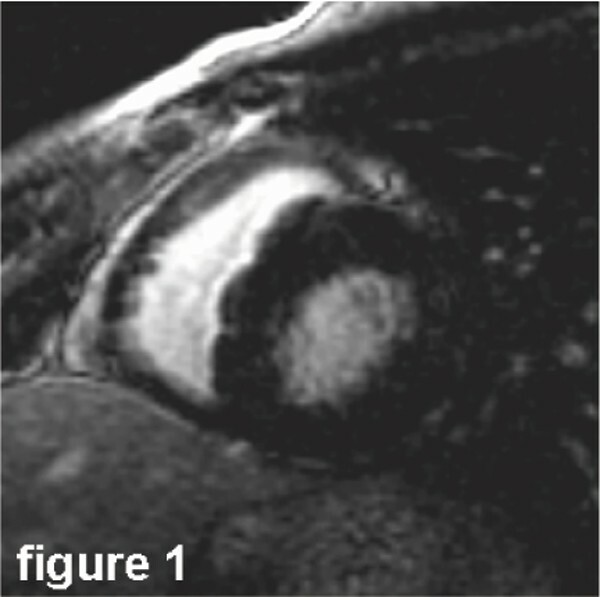 The RV myocardium can be indiscernible between the two black rim artifacts on either side (figure 3, exam to rule out ARVD, black rim artifacts imitate nulled RV myocardium in at TI 220 ms). 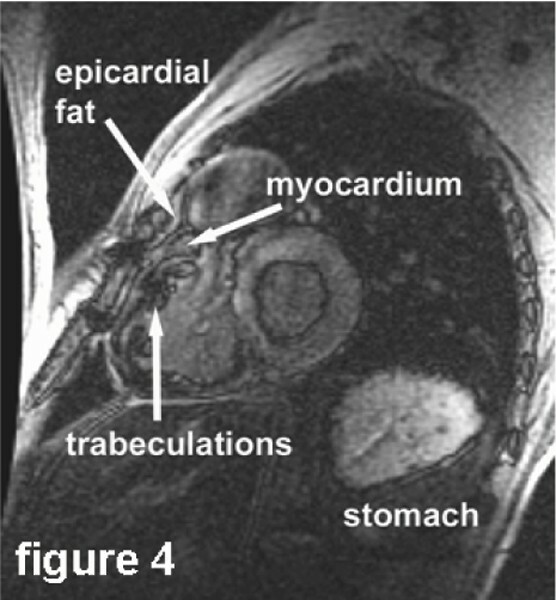 At TIs that are shorter than ideal for the myocardium a black rim can be seen at the border of the myocardium with blood on the inside and with fat on the outside. This artifact is most likely a partial volume effect. It becomes more pronounced with decreasing in-plane resolution, as it is one pixel wide. In contrast, it changes little with varying slice thickness because the SA cuts are perpendicular to the ventricular wall so that the relative voxel composition does not change significantly when the slice thickness is modified. The thin myocardium of the RV is sandwiched between these black rims and, at a low spatial resolution, is no longer visible. Adjacent black rims that are opposed to each other with no discernable true RV myocardium between them may be misinterpreted as myocardium. While black rims also occur on the left side, the myocardium is thick and remains discernable as a separate layer. As a consequence, the optimal TI for the RV mistakenly appears different from that for the left. In fact, in the presence of hypertrophy of the RV, we and others did not find a difference in inversion times between the LV and RV. We conclude that there is no difference in TI between the RV and LV and that sufficient spatial resolution is important for adequate LGE of the RV.